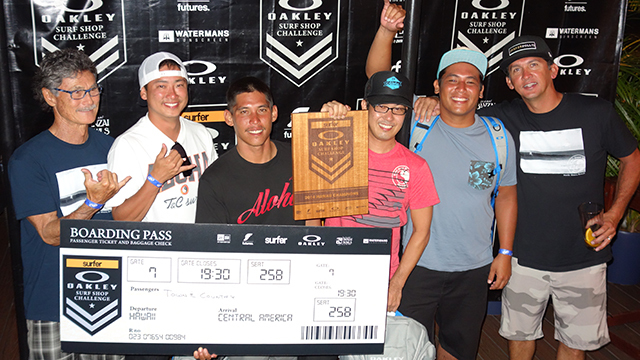 Team T&C Surf was victorious at the Hawaiian leg of the 2014 Oakley Surf Shop challenge, surfing the world-class lefts of Ala Moana Bowls with poise and power. This single-day event matches up Hawai'i's favorite wave-sliding retailers in four-man teams to battle for a golden ticket to the world championship in Central America. The T&C Surf squad–comprised of Kekoa Bacalso, Dustin Cuizon, Travis Hashimoto and Kalei Umoto–will be heading to the Oakley Surf Shop Challenge National Championships later this year at a secret Central American spot. They got to the victor's podium with power surfing with Kekoa "Bam" Bacalso leading the charge. "Man, the waves were firing all day," said Bam. "It was an incoming swell, the tide changed and there was a couple of mental ones!" This year the Oakley Surf Shop Challenge scored the first real South swell of the summer season, and the boys went hard in the final. The rising tide was like steroids for the swell, jacking up the 4-to 8-foot wave face heights for a frothing Kekoa "Bam" Bacalso. The 28-year-old, regular foot from Mililani unleashed his hammer of a backhand attack on Ala Moana Bowls in the final. He earned a 9.67 out of a possible 10 points and even thought the opposing team was cheering for his performance. "I was out the back and I was waiting for that wave, and dude, that thing was a screamer; I really don't want to sound cocky or anything like that but I looked at that wave and I went 'game over, boys,' explained Bam during the awards ceremony of his winning ride. "The heaviest part about that wave is I kicked out and I thought HIC was cheering for me,” he explained. “I was like, 'whoa, I freaking demolished that wave, I kicked out and I heard all the HIC guys screaming: that was really, really bizarre how the HIC guys are cheering for me, but then I see Joel [Centeio from Team HIC] coming out of the pit and then I was like, 'okay.'" While watching Bam drop 8's all day, T&C Captain Travis Hashimoto had a feeling after the second round that their squad had a great chance of bringing home the win. Not only was he frothing on the "W," but he was also over-the moon-stoked on the quality of the Oakley Surf Shop Challenge as an event. Although Travis is a goofy foot and Bowls suited his surfing well, he is still hoping for a right-breaking wave in Central America for the Oakley Surf Shop World Championships. “Anything but a left, I’m goofy foot but I hate surfing lefts," admitted Hashimoto, "any right with trunks: let’s do this!